Description of "Creating A Website"
This is a most basic book for setting up a website on your own, this book help to create a basic WordPress website. Including all the necessary steps needed. 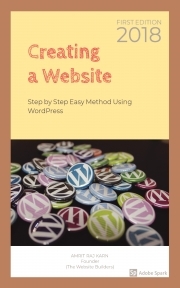 With the screenshots of actual steps involved this book deals with setting up of WordPress on a host, connecting domain, changing theme, installing plugins and many more things. Amrit Raj Karn, the Author of this beginner book is also the Founder of an IT Solutions company The Website Builders (thesitebuilders.in), which helps business and originations to build and run their website. Currently perusing his bachelor’s degree in Computer Science and Engineering from SRM Institute of Science and Technology, Chennai. Worked for many organisations to build their website and help maintaining it. Reviews of "Creating A Website"